Building a dream home can be just as difficult as making a blockbuster movie if your cast of players isn’t collaborating. The three major stars in this production are the client, the architect and the builder. That’s not to dismiss other essential disciplines on the team, but to see a result, the architect needs to dream up the concept and the builder needs to make this vision a reality. When asked about the elements that most often lead to excellent building results, right after owner trust and support, I list the working relationship between the architect and the builder. Each party brings different strengths and points of view to the building process, which is vital in producing an exceptional home. Unfortunately, tensions have traditionally existed between architects and builders and, rather than pooling their skills to get that special yin-and-yang synchronicity that results in magic custom homes, they're more likely to fight like cats and dogs when a project goes south (and it’s inevitable that a project will hit peaks and troughs, even if you have an all-star cast). It’s how your project team weathers the storm that counts. Most of the time, from the architect’s point of view the annoyance is around having to rely on the builder to make their vision a reality, but for the builder the frustration lies? in trying to take abstract plans from a drawing board and make them into a concrete reality, on time and within budget. It's hard to avoid these tensions sometimes, but as a builder we at Adrian Zorzi Custom Home Builder have a few rules we live by, which have seen us successfully collaborate with many of Perth’s most respected architects, and helped us achieve phenomenal results for our clients. An experienced professional — be it builder or architect — will prefer to be involved in a project from the beginning to offer solid opinions on the proposed house plan. To us, building a custom home is something we are passionate about and we want to be connected to the project from the beginning. We are really invested in the craft of what it takes to build a truly fine home. Too often clients hire their architect and their builder separately. Once the architect draws up the plans, the client will shop around the design to builders. This approach has no winners, because the architect doesn’t get to see their plans realised and builders are forced to work around tight deadlines, budgets and design queries. All the while, the homeowner is becoming more frustrated as they wait for the grand unveiling. 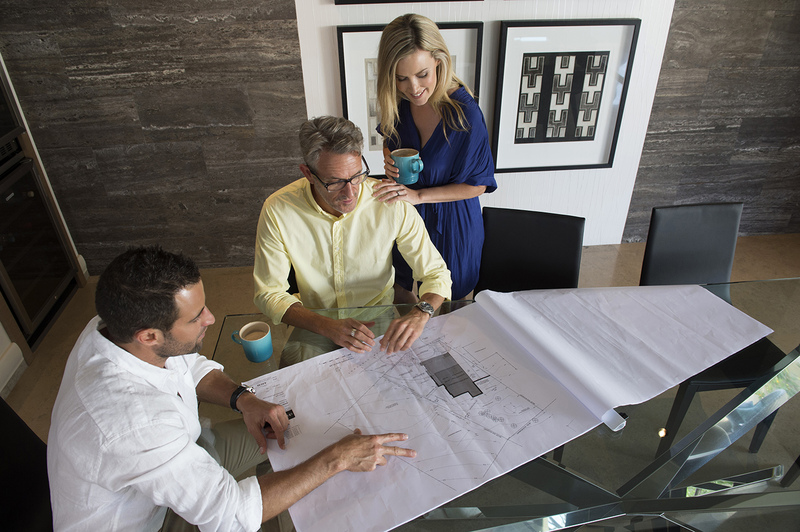 Gathering the whole team — custom builder, architect, and ideally also the interior designer, landscape architect, and other key players the homeowner has chosen — before the project even starts will help ensure everyone is on the same page and avoid nasty surprises later on with unmet budgets and expectations. Selecting the right team can help avoid conflict and communication problems while keeping all players happy. Sometimes, that means reuniting past business partners to save stress and a few extra steps, as those who have collaborated before know how each other work. We love partnering with architects with whom we have collaborated in the past and we find it a huge advantage. Good communication is key to a successful working relationship. Even in today's high tech world, information flows are tightly controlled, and usually bottlenecked. One way we like to facilitate that communication is with regularly scheduled meetings. Everybody gets to have a voice and everyone is clear on the agenda. In between, progress reports and feedback from the architect and owner to allow us to work with greater confidence, less paperwork, and without having to resort to stressful guesswork to keep the work moving while waiting for the next scheduled meeting. Custom builders and architects will have less conflict when they respect each other's talent and experience, so ensure your team has those qualities from the start. There's nothing we respect more than an architect who has paid his dues and commands a good reputation, who does a lot of really good working drawings and the dimensions simply add up. We listen to an architect’s recommendations regarding the design and its execution, and likewise, the architects we have worked with recognise our expertise on building and allow us our strength to shine. We are not trying to be architects, and the architects we collaborate with don’t try to be builders. The builder is the ultimate purveyor of the project and it’s essential that the one you choose commits the time to study and comprehend the architect’s drawings and specification book. Without this, the architect’s best preparation will go out the window and the design intention will be replaced with on-site guesswork by tradesmen. We communicate and enforce the specifications with our tradesmen, ensuring the quality of both the design implementation and construction. Given a design, the builder seeks a way to implement it within the owner’s cost and time parameters. Of course, construction time and cost pressures favour decisions that make the building process easier, faster, and results more predictable, which often works against the creativity of architect’s visions. Choose a builder whose works shows a balance between creativity and pragmatism. We strive to meet cost parameters and deadlines, while realising that these same pressures do not favour construction experimentation, unique or harder-to-build details the architect may have on paper. We will always put in thought and greater care about how we can best complete each construction task while keeping client and architect happy. Choose a team that will adapt to change. Architectural drawings are not usually perfect as desired up front, so the architect will need to make design refinements and adjustments throughout construction phase. We are always willing to change our position on what is best for the project when presented with an opposing point of view that simply makes more sense or has greater promise for an outstanding result. As with most things in life, the development of partnerships in building the best homes hinge on relationships. It takes a level of trust and experience of each party for the most elegant solutions to emerge, which is both the architect’s and our end goal. Just like team sport, every position has a role in achieving a win, so everyone should feel like an integral part of the design and construction process.